Homeschool moms can get so bogged down wth time seeming to be ever elusive. Yet we know that if fail to fill our own cups, we’ll soon find we are empty and unable to fill the cups of our children, spouses, friends, and others. We need to take the time to care for ourselves as we are caring for others. 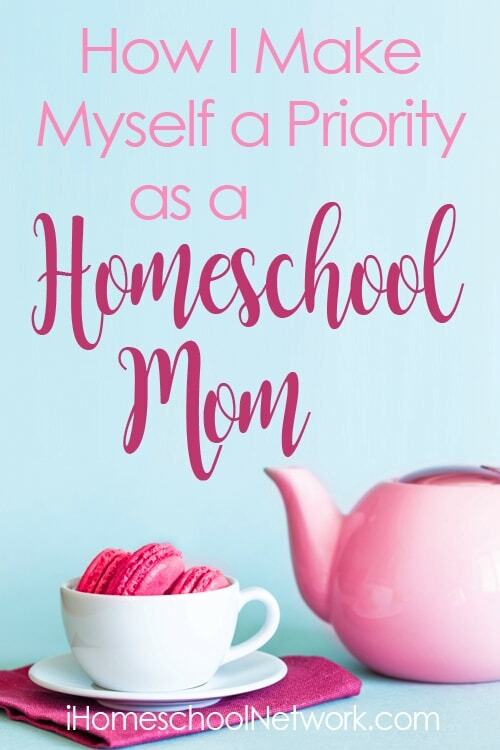 But the question remains… how do I make myself a priority as a homeschool mom? “Dear Mom, let me tell you if you do not take care of y ou that you will not be able to go the distance.” – Mary Clendenin, The Big Book of Homeschooling Ideas. While homeschooling is a wonderful endeavor it can be hard and be demanding. It can sap our energy and leave us feeling exhausted, uninspired and without joy. It’s imperative that you find ways to care for your own needs, to learn how to prioritize yourself as you balance the other demands on your time. With that knowledge, we are sharing with you tips on how to make yourself a priority as you go through the homeschooling years. What about you? What are you doing in your own life to make yourself a priority? Maybe it’s setting aside time to walk each day, or plant and keep a garden. It might be that you spend time each day in prayer or meditation or you’ve dedicated time to read for entertainment. Whatever it is, share one way that you are prioritizing yourself in the comments below.